Summary: The OAA and OBA types were open wagons with steel ends and wooden dropside doors, built in the 1970s for use on Air-Braked Network (ABN, later Speedlink) services. A decline in general merchandise traffic affected the fleet and many of the OBAs were transferred to departmental use within a few years. Later, both types saw a variety of modifications and conversions for other duties. History: The 20ft 9in wheelbase air-braked underframe became the standard for new wagon construction in the late 1960s and in 1971 the first open wagons to this specification were built. 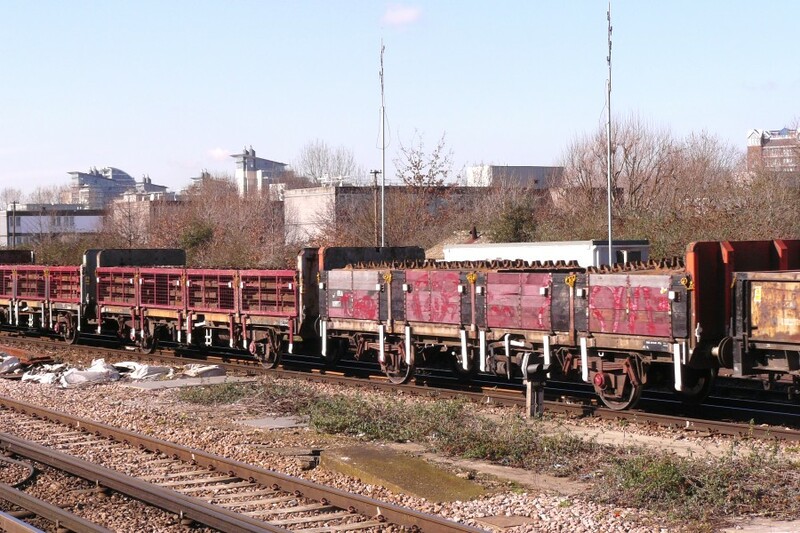 Lot number 3727 and diagram 1/191 were issued for the construction at BR Ashford of 100 open wagons numbered in the new air-braked series as 100000 to 100099. The order was originally for 150 wagons but was cut back before work started. Capable of carrying 31 tonnes, the new wagons had three six-plank dropside doors on each side, with stanchions in between that were removable to provide full length access if required for loading. Each door had three hinges, with strapping running the full height of the door, and two door controllers, obviating the need to have doorstops or 'bangers' on the solebars. The ends were steel with two vertical T-section steel supports. Painted in freight brown, the entire batch was delivered between October and November 1971 carrying the code OPEN AB. Most also carried the ABN marking on a yellow circle. With the advent of TOPS, the code OAA was applied, and the wagons were assigned design code OA001A. In 1974, OAA number 100043 was rebuilt at BR Shildon under lot number 3861. It now featured four dropside doors on each side, still with removable stanchions in between. Although made up of five planks rather than six, the height of each door was only very slightly shorter than the standard OAA. The new doors did not have controllers fitted but curiously the wagon seems to have not gained bangers to replace them. The original ends were retained and had hinged extensions added. When it emerged that August, the wagon had been renumbered in the steel-carrying range as 450000. It may have carried TOPS code SDA for a while, but was certainly later coded SCA, with design code SC001A, and classfied as a Tube wagon. During a return to Shildon in 1976 it was further renumbered to 110000 and given TOPS code OBA, design code OB001B. Lot number 3909 was then issued for the construction of 500 wagons to the revised design. Built at BR Ashford, these were delivered from late 1977 into spring 1979, taking the numbers 110001 to 110500. Design code OB001A was allocated and, compared to the protoype, the production batch had slightly longer bodies and taller, fixed ends with rounded corners. Mounted on each solebar were 8 prominent door bangers, the doors having circular stops in the corresponding positions. The stanchions between the doors had telescopic inner sections, which could be raised to the same height as the ends. Wire hoop handles were fitted to the top of each to facilitate raising and lowering. Internally, six turnover bolsters were provided to allow for different loading methods. A second order (lot number 3930) was placed for 300 more OBAs, deliveries from BR Shildon starting at the end of 1978. Allocated design code OB001C, these wagons differed in having Bruninghaus parabolic springs in place of the 15-leaf springs on the earlier OBAs and square rather than round doorstops. The last OBA, numbered 110800, was delivered in September 1979. Between 1980 and 1984, most of the earlier batch were retrofitted with the newer springs. All OBAs were delivered in the new maroon livery with the boxed Railfreight logo at the right hand end. The wagons saw use on a variety of traffics carrying loads such as coiled steel wire, paper for newsprint and timber. The new Railfreight livery, introduced in 1979, was applied to some OAAs and OBAs and involved the ends and top two planks of the sides being painted red with the remainder in grey. In 1982 the surprising decision was taken to transfer a large number of OBAs into departmental use. The prototype and 479 of the lot 3909 wagons were assigned to the Civil Engineers fleet and recoded ZDA. Design codes of ZD143A (prototype), B and C were issued to reflect minor differences and a new fishkind name of Bass was applied. The wagons all gained a DC prefix to their numbers but many were just patch painted. Later on, the Civil Engineers livery of yellow (top two planks) and grey (remainder) was applied. Of the remaining lot 3909 vehicles, 6 (along with 4 wagons from lot 3930) were modified with cradles to carry HST spares for the Mechanical and Electrical Engineering department and were given ADC prefixes to their numbers. The ZDA code was also applied to these but with design codes of ZD145A and B and without any fishkind name. 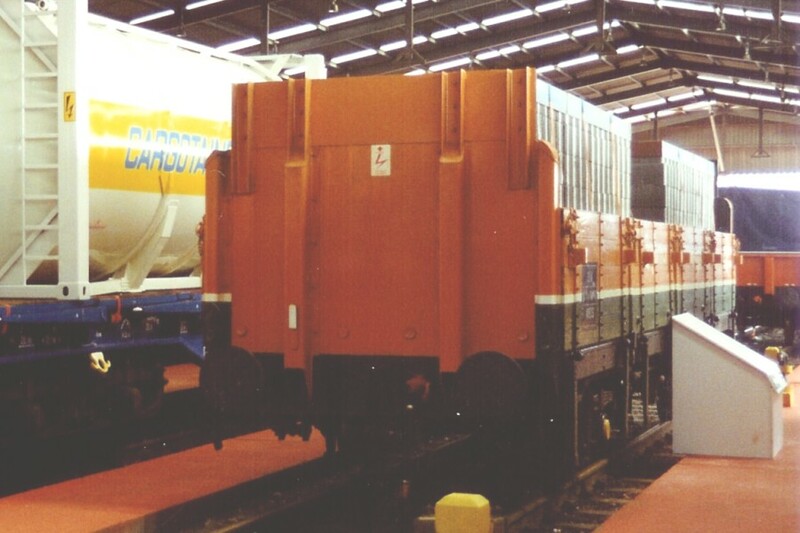 Although not officially transferred at this time, many of the OAA wagons were also in departmental use while others saw temporary use as barriers in Speedlink trains. The other 15 wagons joined 15 of the lot 3930 OBAs in being sold to British Nuclear Fuels Ltd (BNFL) in March 1983. These all had their sides removed, and a new floor fitted with lugs to accept skip-like containers. The first wagon treated (110624) was originally to be recoded as an FKA in the railway-owned series but this was changed to PFA when it was decided to sell the wagons to BNFL. Renumbered as BNFL91000 to BNFL91029, the wagons had a mixture of Bruninghaus and 15-leaf springs but all were given design code PF008A and were used on short journeys between Sellafield and Drigg conveying low-level nuclear waste. In 1993 the wagons were refurbished, losing their ends in the process to become fully flat wagons. A few years later they were transferred to use as barrier wagons on nuclear flask trains across the country. Withdrawals started in about 2000 and all had been scrapped by 2007. In 1985 a further 15 OBAs were transferred to departmental use as ZDAs and given ADC prefixes (110515 to 110529) while a single wagon (110793) was selected for conversion (at Cardiff Cathays) to an OEA. This was a design to carry packaged timber and featured a sliding canvas hood between two extended ends. Curiously, the ends and the hood had a peaked rather than rounded end profile. The wagon was used for a while in Scotland but then spent several years out of use. In 1991 it was transferred to the departmental fleet as ZRA DC110793 (ZRA-E to ZR236A, but possibly later changed to ZDA-Q to ZD171A) but was not modified in any way. The unique wagon remained in store, initially at Tyneside Central Freight Depot, then Tees Yard until official withdrawal in about 2000. Also in 1985, up to 30 OAA wagons were modified to carry roof tiles for Redland and some of these were repainted in that companies pale green livery. A few more transfers to departmental use, plus the scrapping of OAA 100060 following accident damage, meant that just 363 wagons remained in revenue use by March 1986, comprising 98 OAAs, 264 OBAs and the sole OEA. In the departmental fleet, two of the CMEE ZDAs were recoded to ZVA following modification (removal of sides and ends) for use as bogie carriers. A new use for the OBA type was carrying concrete blocks for Plasmor Ltd. Wagons dedicated to this traffic had their ends extended in height and some were repainted in the company colours of orange with olive green lower sides. Later replaced by POA conversions, the OBAs returned to other duties. In 1988 some 30 surplus OBAs were rebuilt as RRA runner wagons, again entailing the removal of the sides and ends. The wagons were modified at Cardiff Cathays and new design code RR046A assigned. In service, the RRAs were used between steel carrying wagons with over-length loads. The year also saw the first official transfers of OAAs to the departmental fleet, 5 wagons becoming ZDAs to design code ZD155A and with a new fishkind of Squid. By 1989 the revenue fleet (excluding barriers) was down to 206 wagons (93 OAA, 112 OBA and 1 OEA). Starting in 1990, most of the OAAs were transferred to departmental use as ZDAs, mainly for use on the Southern region. These included some of the wagons modified and repainted for use by Redland. Several OBAs joined the S&T fleet, becoming ZDAs to design code ZD145B and gaining a KDC prefix to their numbers. Most were repainted in the bright red and yellow used by this section. Also transferred to departmental use were some of the OBAs previously converted to RRA runners. These were recoded as ZEAs with the fishkind of Bream and design code ZE009A. By the start of 1991 the revenue fleet contained just 33 OAAs but the OBA fleet had been bolstered by transfers back from departmental use and stood at 205 wagons. The first of what was to be very many conversions to ZCA Sea Urchins appeared at about this time. 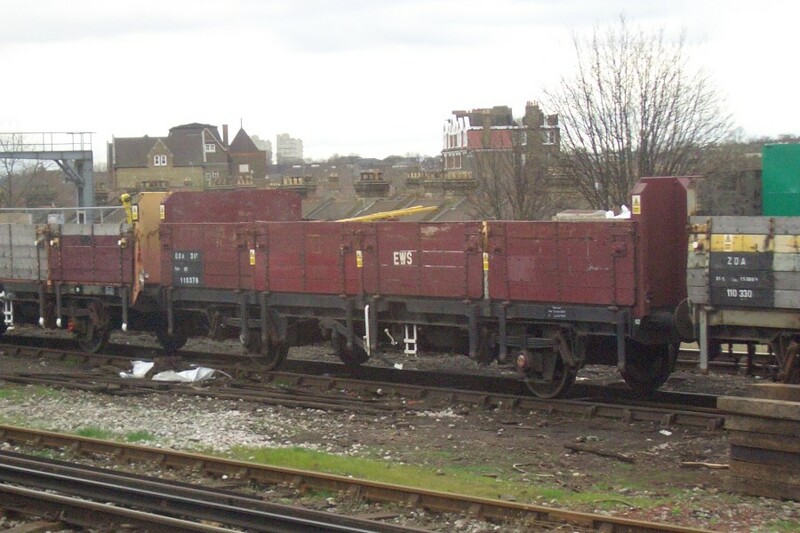 A pair of ZDA Bass wagons had their wooden dropside doors replaced by lower fixed metal sides, making the type more suitable for use carrying ballast and spoil. Marcroft Engineering and Powell Duffryn Standard converted one wagon each. The programme followed on from earlier conversions of OCA and SPA types to ZCAs as Sea Horses and Sea Hares respectively. A further 42 OBAs and ZDAs were converted to ZCA at Marcroft Engineering in Stoke. The full TOPS code was ZCA-P and design codes covered the range ZC011A to D (for former ZD143 wagons) and ZC012A/B (former ZD145s). The conversions to ZCA Sea Urchins continued slowly for the next few years, using OBA, ZDA and ZVA wagons as sources, as and when their bodies became uneconomical to repair. To compensate for the reduction in ZDAs, other OBAs were transferred to general departmental use. With further conversions to RRA runners also taking place, the fleet of original OBAs had shrunk to just 105 examples by the end of 1992, along with 12 OAAs. The Sea Urchin programme had by then started using former VDA vans as source wagons. In 1993, 18 OBA wagons that had been modified for use by Plasmor were sold to that firm and renumbered as PLAS4669-4686 with TOPS code PNA. They intially operated in as-acquired condition. A further 8 former ZDAs were added in 1997, becoming PLAS4687-4694. Converted at RFS Doncaster, the wagons had new, taller ends fitted and the side doors replaced with fold-down mesh panels. RFS also won a contract to refurbish the earlier PNAs to the same specification. 1994 started with just 38 wagons still coded OBA and 9 as OAA. However, changes were afoot with the division of Railfreight into three regional companies as a precursor to privatisation. With this the distinction between departmental and revenue fleets became somewhat irrelevant and many of the un-modified ZDA Bass wagons were recoded as OBAs. 20 more ZDAs were rebuilt as ZCA Sea Urchins at Marcroft Engineering, the latest batch having their numbers prefixed with T (for railfreight company Transrail) instead of the usual DC. Design codes ZC012C, D and E were assigned. 20 more conversions, this time by RFS, followed in 1995. All 40 wagons were painted in plain grey, some with the Transrail 'Big-T' logo. In 1996, Mainline Freight received a batch of 20 ZCA Sea Urchins converted at RFS from OAA and OBA wagons. These wagons were painted in mid-blue with yellow capping, and had M prefixes to their numbers. The big news of 1996 was of course the takeover of all three regional railfreight companies by English Welsh and Scottish Railway (EWS). EWS accelerated the process of recoding unmodified ZDAs back to OAA and OBA and also started painting some overhauled wagons in overall dark red. New TOPS code OMA was allocated to former OBA and ZDA wagons, with 37 wagons being assigned for conversion. It would appear that this never took place and the code was cancelled. What did take place was the modification of two OBAs with experimental replacement doors. One had steel doors, the other aluminium ones, and the wagons (110300 and 110700) were apparently recoded as OCA. Whether this recoding took place is not known but both had reverted to OBAs by 1999. OBA 110018 was also fitted with aluminium doors in 1998 and retained the code with new design code OB001K. It was used on a new traffic conveying concrete blocks between Merehead and Acton alongside 24 un-modified OAA and OBA wagons. 40 OAAs comprising 37 OAA-C to design codes OA001A and B, plus 3 OAA-T (high ends and winches) to design code OA001C. 308 OBAs (all OBA-M) to design codes OB001A, C, F, J and K.
20 OTA-Fs to design code OT004A. 80 RRAs, thought to all be RRA-O to design code RR046A. 204 ZCAs comprising 30 ex OAAs and 174 ex OBAs. The former OAAs were all to ZCA-O, design code ZC019A, apart from one ZCA-P to ZC012G. The former OBAs were mainly ZCA-Ps to a range of design codes (ZC011A-D and ZC012A-G). 183 ZDAs comprising 28 former OAAs (ZDA-P to design codes ZD155A and B) and 155 former OBAs as ZDA-A (ZD169A), ZDA-O (ZD143D and E) and ZDA-Q (ZD143A, C, F and G plus ZD145F and ZD171A). 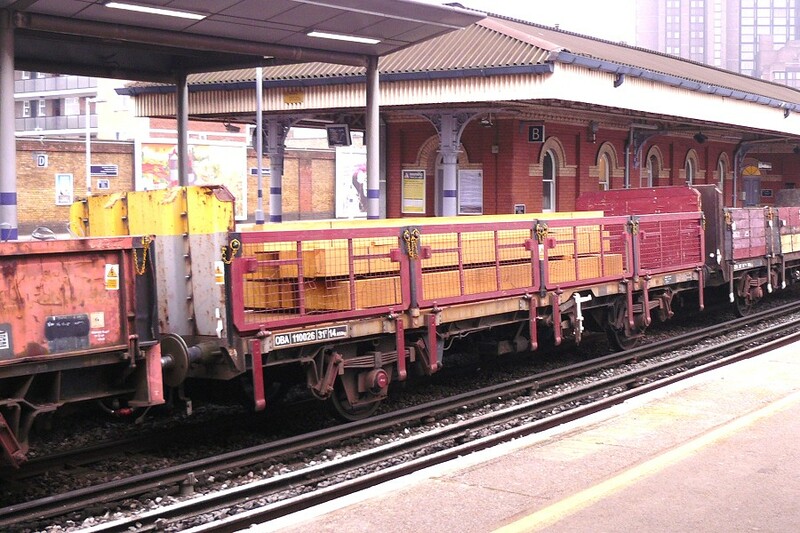 Towards the end of 1999, a programme of replacing the doors on the OAA wagons allocated to the Merehead to Acton concrete block traffic was started. Unlike prototype 110018, the new doors were formed of metal mesh, to reduce weight and improve visibility. New TOPS code OAA-F was allocated and some of the wagons were also used carrying blocks from the Camas quarry at Croft. From about 2007 onwards, some OBAs were also fitted with mesh doors. 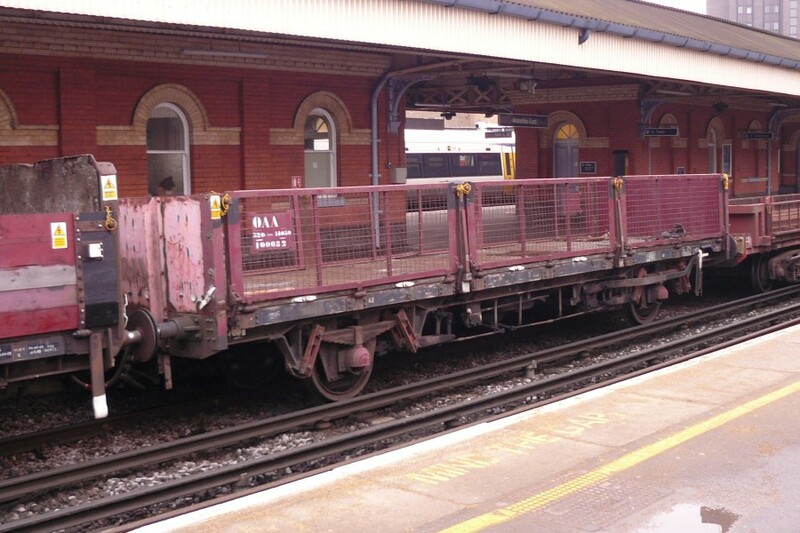 A new use for OBA wagons came in 2000 with the fitting of rail handling equipment to wagon 110375. This was used to unload lengths of long-welded rail from conventional bogie flat wagons and the equipment, made by Robel, was known as a rail putler. The wagon, which had its ends and some of the side doors removed, did not apparently have its TOPS or design code altered. It was later joined by 110668. No more major conversions affected the OAA/OBA fleet after this time, and withdrawals of damaged and worn out examples gathered pace. Apart from the concrete block traffic, most of the remaining wagons were used as general-purpose carriers in connection with infrastructure works, with many in faded or patched-up liveries. The ZCA Sea Urchin fleet also saw a decline in use, being supplanted by newly converted MFA, MHA and MTA ballast/spoil wagons. At the end of 2005, 54 OAAs and 357 OBAs were still in stock, along with 21 OTAs, 56 RRAs, 199 ZCAs (30 ex OAA and 169 ex OBA), 21 ZDAs (3 ex OAA and 18 ex OBA) to give a fleet total of 708. By 2008 this had fallen to 621, of which 503 were in regular use. 10/06/2008: Minor revisions and corrections. 16/03/2010: Three new photos added. OAA 100082 at Clapham Junction, 31st July 2006. OAA 100082 again, now with replacement mesh doors. Waterloo East, 6th February 2010. OBA 110075 in original condition. Northampton, 26th September 1982. OBA 110612 resprung in Railfreight livery. Middlesbrough, 23rd September 1988. OBA 110376 at Clapham Junction, 10th April 2004. OBA 110535 showing Plasmor modifications. Cricklewood, 15th April 1989. Original (110597) and mesh-doored (110123) OBAs. Clapham Junction, 1st March 2010. OBA 110026 with mesh doors. Note that the ends retain the former livery. Waterloo East 6th February 2010. OEA conversion 110793 seen in a dilapilated state in Tees Yard, 19th July 1998. At this time it was still carrying the ZRA code.